We have gained recognition as an eminent enterprise, devotedly engaged in manufacturing and supplying a broad range of Flexo Printed Bags. 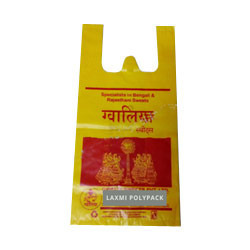 Founded in the year 2009, at Ahmedabad (Gujarat, India), we “Laxmi Poly Pack”, are the leading firm, engaged in Manufacturing and Supplying the finest quality range of LD Poly and Linear Bags, HM Poly And Linear Bags, Printing Bags, Poly Bags, Laminated Pouch, HD Poly Bags, etc. We have constructed modern production unit, which comprises of several divisions like procurement, production, warehousing, quality testing and sales & marketing. Under the leadership of our mentor, “Mr. Harshad Sinh Chauhan” (Marketing Manager), we have been able to fulfill the urgent requirements of our valued clients in the best possible way.